1996年 京都にてT-Shirtsのデザイン活動を開始した事によりリクリエイトデザインワークスがスタートする。 2013年 グラフィックデザインだけでなくライフスタイルを提案できる店を作る事をテーマに京都三条に直営店であるリクリエイトをオープンさせる。 2016年 以前より交友があったSATOCIが参加する事となり現在に至る。 オリジナルレーベルとしてOldGoodThings,TRESREYES,Prestigeを運営。 -INTRO ~1996,re:create Design Works inc founder "BT","He worked apparel business for longtime.His work is Management,Buying,Sales,New store open and more...so hard. In 1996,Started design works of clothing in KYOTO.It is beginning point re:create design works. 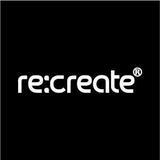 In 2013,Our 1st retail store open,store name "re:create" in SANJO KYOTO. In 2016,Our old friends "SATOCI" join our crew. In 2017 ,Kick off International sales and wholesales project. Now. 2018,I don't know... -ETHOS We can do "re:create" anything in the world. re:create crew work hard and plays more hard. -OUR PRODUCT "OldGoodThings/オールドグッドシングス" Never Come to an end. OldGoodThings are friends and street culture and sub culture lovers communities. Product design in collaboration with my friends,artist,creator,from all over the world.I learned many things from street coulture and want to transmit learned street coulture to future generation. ”I hope street culture will remain 100 years later”I create OldGoodThing product with such thoughts in mind. "TRESREEYES/トレシャーアイズ" In2013 Opening our retail store "re:create" in Kyoto,We started the original brand "TRESREYES".We want to create orijinal products through our filters. We have been influenced by 70 to 90s good music and movies,It is making the theme of TRESREYES to output to the current street scene.